Adda: SAARC Summit Coverage: Western Media Bias or Neglect? 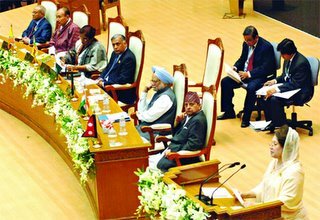 SAARC Summit Coverage: Western Media Bias or Neglect? SAARC summit started in Bangladesh on November 12th. Seven head of states of South Asian Countries sat side by side who represented 1.5 billion people- one fifth of the world population. It’s true that SAARC has neither yielded much cooperation among member countries nor subsided bitter animosity or mistrust between India and Pakistan or its neighbor. Yet, the spirit of SAARC can usher renewed commitment to friendship, mutual understanding, and openness in bilateral and multilateral relationships among member countries. The ultimate success of SAARC cooperation can dramatically uplift the South Asian countries towards a common goal of prosperity and peaceful coexistence. CNN: No news about SAARC Summit in the main page or in its international section. AFP: AFP news coverage via Yahoo news: Under World-Asia section- South Asian rivals say only peace will end poverty. Google News Search: Google news search shows summit coverage mainly by Indian, Pakistani and Chinese news outlets. The destiny of 1.5 billion south Asian people is sadly intrigued by an alarming precedence of poverty, natural disaster, nuclear threats, and terrorism. Undoubtedly, a fire cracker blast in Dhaka city on the eve of SAARC Summit could potentially draw much more media attention in the Western news channels than a blissful and cordial summit of these seven head of states!!! Unfortunately, this significant happening has been pitifully neglected by the Western media outlets. Is it western Media bias or intentional neglect? Addabaj is not begging or whining for big media coverage of the summit, rather he is challenging the big western media channels to redefine responsible journalism dedicated to promote human peace and understanding. Believe it or not, this World is really getting smaller where communities living on both sides of the Atlantic uniquely share the same pain and threat whether that’s been covered by these Media channels or not. I was looking for blog entries of SAARC and it seems nobody other than the Bangladeshis have interests in SAARC. It sadly reflects the reality of the whole affair. I arrived here from the link on Rezwan's blog. The answer to the question you pose in the title of this post is in your previous post. South Asian governments have shown absolutely no initiative to put aside divisive issues and focus on things that can be possibly done together. Small wonder that the rest of the world largely ignores this inconsequential meeting.